Winter Cyclist: Taking one for the team. Fairbanks Memorial Hospital is again participating in the Heart Walk. I think most of the people who know me in any capacity are up for abusing me in some way if possible. Thus I offered myself as a target for charity in hopes that people would actually donate money to make me uncomfortable in some way. Our department’s initial idea was that people could pay to throw a pie in my face. While probably attractive to some, the idea didn’t sound very sporting to me. I just couldn’t see doing any trash talking if all I was going to do was sit there and get pied. Also, it seemed like it would get old for everyone after I took the first few. 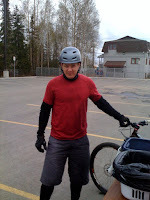 I like riding my bike, so our second idea was that I could ride my bike around while people tried to hit me with pies. This idea sounded much better to me. Not only would I be riding a bike, but I’d at least have a sporting chance, thus trash talking would be appropriate. I soon realized that a pie plate hurled like a frisbee would probably do enough damage that it wouldn’t be fun for me if I actually got hit. Someone made the suggestion that people could throw water balloons, and the idea was cemented. Last week was beautiful, sunny, clear skies and record high temperatures in the 70s. This week has not been. So when we started setting up this morning and it snowed a little, I knew I was in for a real treat. I can’t imagine having more fun. Riding my bike in a circle (my designated area was six parking spaces big) and taunting people while the try to hit you with water balloons is awesome. I recommend it to anyone. I got nailed quite a few times, including once in the melon, by not nearly as many times as I watched and grinned as balloons passed harmlessly close to me, or braked hard and watched a balloon fly past my bars as someone was trying to lead me. All in all we raised several hundred dollars for a good cause and many of my friends got to take some well earned shots at me. Plus riding a bike NASCAR style is much easier than working. Taking one for the Gipper? Good for you Mr. WIntercyclist. I may not "know" you but I know your kind. I bet you are the wild one at your job and those who actually hit you felt some internal joy. LOL.